The company HomeServices.cc, LLC is a licensed home improvement contractor in the state of Connecticut that is insured with the John Ott insurance agency as home owners want to be assured that they are protected from reckless or careless contractors. One of the most stressful parts of hiring a contractor is having them come into your personal space… will they respect it? will they damage anything? With David Cox, that doesn’t seem to be the case, as according to him, “He wont even step foot inside your house without changing his shoes first!” And after every job is done, he’s cleaning up any fallen debris. Gutter cleaning is not a glamorous or high tech job. It is physical work that needs to be done carefully. Heavy duty commercial ladders are used with the proper safety gear. 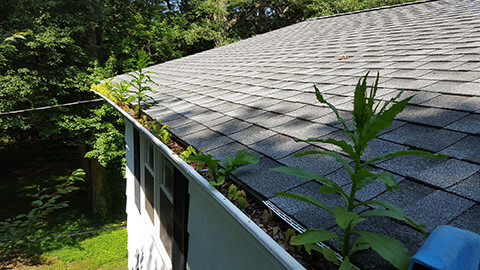 Every inch of the gutters are cleaned and all downspouts checked to be open and free flowing down to ground level. However, it is apparent that Dave has a few tricks up his sleeve to get the job done quick and easy… In fact, within 2 minutes of our interview he was already giving me some life hacks for my own place! Power washing of homes and decks is done with special equipment that efficiently applies the professional cleaners to the house in a dispersed mist that lays the soap on the house. The cleaners do the work to kill and remove the mold as well as release the dirt from the siding surface. Then the house is rinsed. Best Google Places Review: Great company! Dave took the parameters of my request to solve an issue and made sure to analyze every “could be…” detail before taking action. I had previous companies (even BBB A+ rated) deal with same problem, but instead of listening to me they plowed on towards what *they* wanted to act on, rather than the necessary holistic approach. Fairly priced and was the best experience i had with service companies.